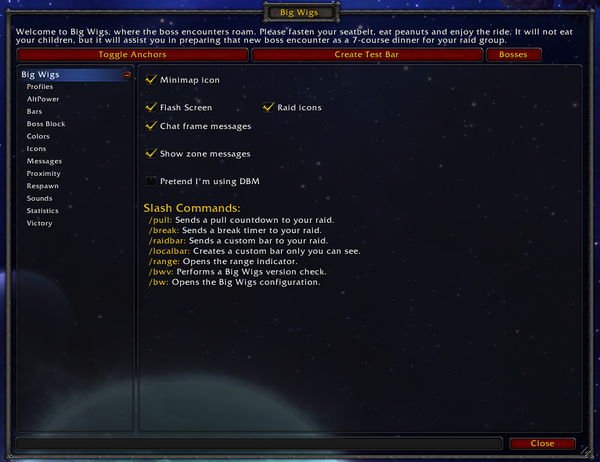 BigWigs is a World of Warcraft AddOn to predict certain AI behaviour to improve the players performance. This Modification is build for Patch 1.12.1 and its content for use on the NostalriusBegins private Server. The adjustments were made by LYQ. Please refer to this repository for more information. a) If you choose to download the .rar file all you have to do is extract the archive in your /World of Warcraft/Interface/AddOns/ directory. b) If you download the raw code from GitHub (Download ZIP) you’ll have to unzip the downloaded archive and rename the folder from ‘BigWigs-master’ to ‘BigWigs’ and place it in your /World of Warcraft/Interface/AddOns/ directory.